← What Can You Do to Help a Senior Who Is Afraid of Falling? This July, your elderly loved one might enjoy trying something new with her wheelchair. It’s National Wheelchair Beautification Month and there’s actually a lot that you and your senior can do to spruce up her chair. 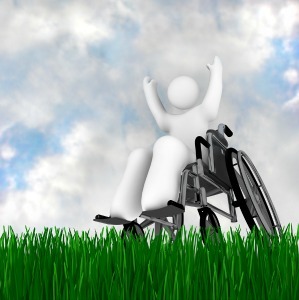 Many people don’t realize that wheelchair manufacturers offer a lot of ways to customize wheelchairs. The best part about these customizations is that you know they’ll work with your senior’s wheelchair without having to compromise safety or other considerations. Some of these options might not feel custom enough for your senior, though, which is where other ideas might come in. Almost all wheelchairs are pretty basic, particularly when it comes to their color. So one of the fastest ways that your senior can reclaim her wheelchair and make it feel like hers is to add some color here or there. She might also like a theme, such as flowers, her favorite sports team, or even a hobby-oriented theme. When you’re decorating your senior’s wheelchair, you might need to think outside of the box a little bit more. Silk flowers work really well, but she might love changing out real flowers every few days. You can use florist tools to help those flowers stay alive longer. Other options might include finding a vinyl wrap shop that can create a vinyl wrap for your elderly family member’s wheelchair. Some people who use wheelchairs are okay with one set of customizations all the time. But other people might get bored with that year round. That’s why having different ways to dress up your elderly family member’s wheelchair based on the season or the holidays that are approaching can be a lot of fun. This can also help to make her wheelchair a source of fun rather than something she feels forced to use. Ideas for beautifying your elderly family member’s wheelchair can come from literally anywhere. You might find little bits and bobs all over the place that can be repurposed as wheelchair decorations, too. The more that you and your senior stay on the lookout, the easier it will be to spot these. This can be a fun project for you and your elder to do together, but it can also be something she might enjoy doing with friends. This is also a project that elderly care providers can work on with your senior, both as a bonding activity and to help your senior feel more in control of her wheelchair. This entry was posted in Elderly Care Arlington TN, Fun Activities/Crafts and tagged Elderly Care Arlington TN. Bookmark the permalink.